Beyond the gate is a wooden spiral staircase climbing up one floor to a corridor heading west that is trapped by a pressure plate in front of an iron door. The plate triggers a spear trap from the side walls. If the trap is triggered this will alert a leveled draugr in the room through the doors. This next chamber has a central rectangular pool with steps down into it on all sides. There is a long stone table to the north of it, with three dead draugr, a few burial urns and a salt pile on top. 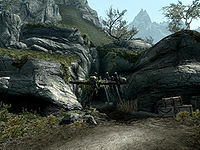 The wall to the north has two upright sarcophagi against it, which will burst open releasing two more draugr to attack. To the south of the pool there is a smaller stone table with a giant's toe, a Falmer ear, a bottle of alto wine, a bowl of frost salts, three bulbs of garlic and a leveled healing potion on top, among loads of candles on stands. There is also a food barrel and a burial urn beside the table, and a flooded hole in the floor to the west. Against the south wall is a set of shelves holding two ingots of refined moonstone, a random pair of gauntlets, a skeever tail, a copy of The Wolf Queen, v6, five common books and (if you have reached level 24) there is a copy of Boethiah's Proving which will initiate a quest to find the Sacellum of Boethiah. To the west there are a double wooden door with an urn to the right and a set of shelves to the left holding two more common books. Diving into the hole west of the table allows you to access a flooded chamber under the floor, with an unlocked chest a few paces to the north of the hole, in an alcove to the west. Esta página foi modificada pela última vez à(s) 00h01min de 28 de janeiro de 2016.